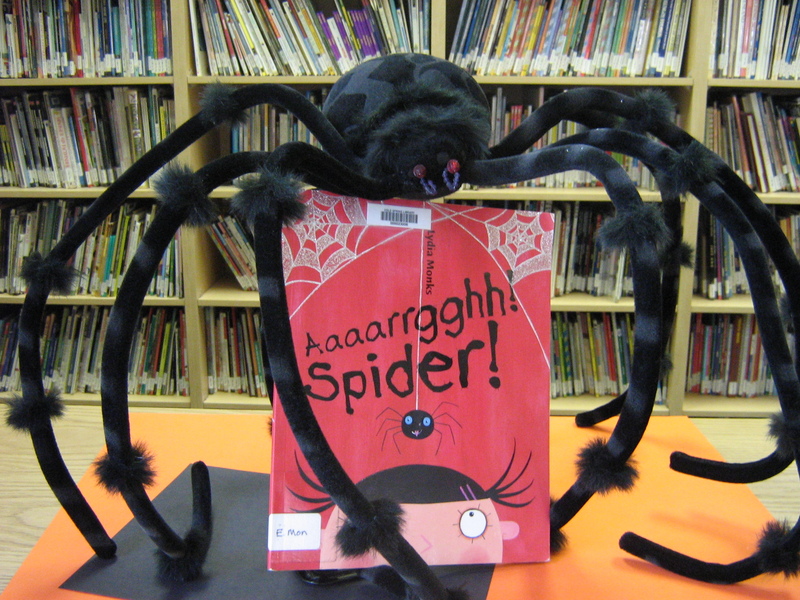 To get ready for Halloween, first graders learned about spiders this week in the Library. After seeing a Keynote presentation with facts about spiders and some pretty scary spider pictures, students heard Lydia Monks’ very funny book Aaarrgghh! Spider! The story of a little eight-legged creature who longs to be a family pet starts out with a great view of a living room from the spider’s point of view. After being thrown out of the house numerous times, the little spider finally becomes the family pet after displaying a talent for decorating the back yard. This is a fun little story that brings out many of the facts students learned about spiders and is a great example of the literary device, point of view. Kindergarten–Our first stormy day of the school year was the perfect time to read Move Over Rover by Karen Beaumont. Rover’s in his doghouse all alone until it starts to rain and then one by one animals squeeze in with him until a skunk manages to sneak in. All of a sudden, all the other animals make a hasty retreat until at last Rover has his house alone again. The cyclical plot of the story is great for Kindergarteners and because the story is in verse, we practiced recognizing rhyming words. Second Grade–Continuing with our spider theme, second graders also saw the Keynote presentation about spiders and then loved hearing Dianne Cronin’s Diary of a Spider. We talked about the use of a diary and how our blog is like an online diary. Then students had lots of fun listening to Spider’s entries and comparing them to the facts about spiders. Third Grade, Fourth, Fifth, and Sixth Grades–This week we (finally!!) figured out a way to hook up our catalog stations. Even though it is a temporary hook up, students were excited to get back to looking up books. For third graders, this is their first experience with independently using the catalog. Upper graders remembered how to use it and we reviewed the differences between fiction and non-fiction call numbers and they enjoyed finding their own books on the shelves.